This is a claim that you will often hear from TDLT and the US Forest Service. 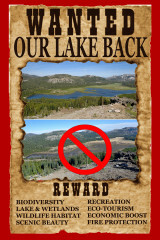 The claim is that utilizing the same Pond and Plug meadow restoration methods used to restore Perazzo Meadows, Donner Summit Valley can be “restored” to something similar. This claim is actually pretty simple to refute. It is simply a question of the quantity of water available to each valley, the location of each valley and the hydrological timing. In hydrological terms the amount of watershed that drains into a valley is called the catchment of the valley. 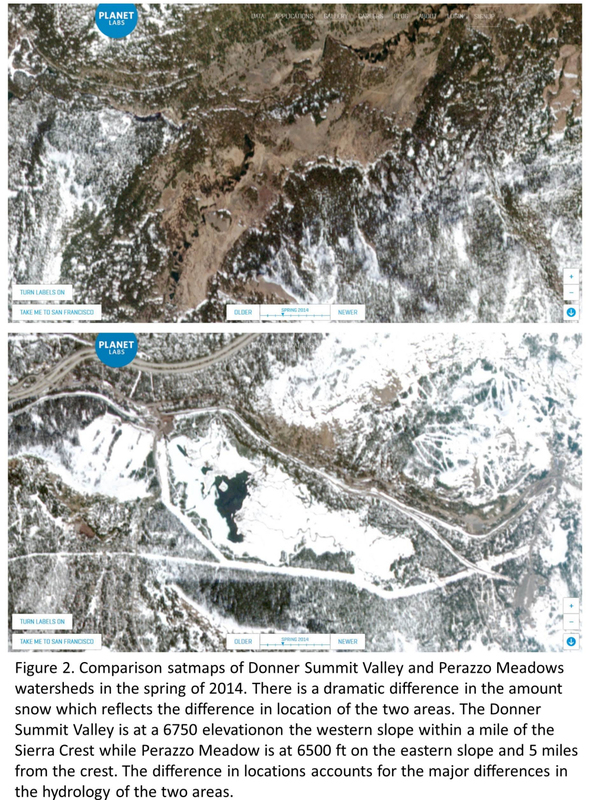 In Figure 1 the watershed catchments are shown for Perazzo Meadows and Donner Summit valley. 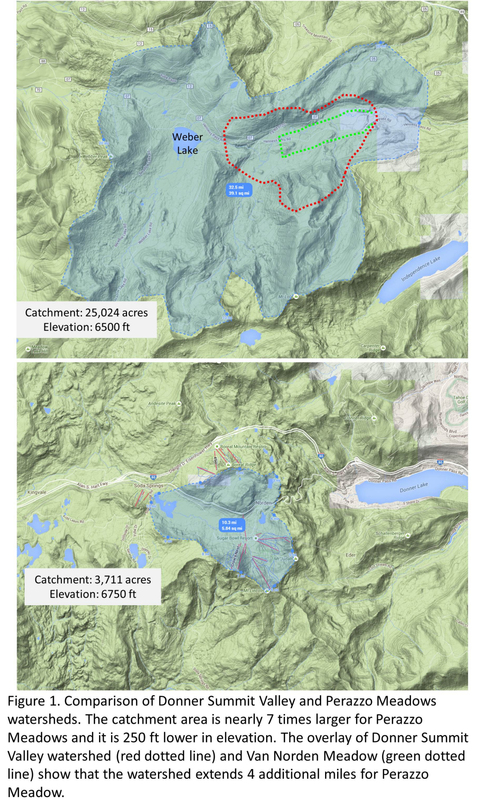 As the figure shows, the catchment for Perazzo Meadows is close to 7 times as large as the catchment feeding the Donner Summit Valley. As described in a previous post, unlike Perazzo Meadows which is more of a transitory meadow in which a large volume of upstream water feeds the meadow during the summer growing season, Donner Summit Valley, located with a mile of the crest of the Sierras, is not fed by a large upstream catchment and runs dry about half way through the summer growing season. The hydrological timing of the two valleys is also different. In Figure 2 the difference in timing between the two valleys is clearly shown on satmaps (data from Planet Labs). While Donner Summit Valley is still covered with heavy snow throughout the spring and early summer, Perazzo Meadows is already free of snow and water is flowing down through the meadows. In this situation, Pond & Plug methods that sustain over topping of the river do retard the draining of the meadow and maintain groundwater. Additionally, lower Perazzo Meadows is fed from Weber Lake which sustains flow through most of the summer. The situation is different in the Donner Summit Valley. 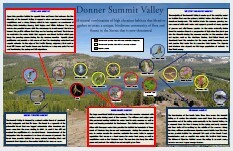 It is the melt of the heavy snow in the Donner Summit Valley in spring and early summer that keeps the valley wet through the first half of the summer growing season (not over topping of the Yuba river). However, unlike Perazzo Meadows, there is no upstream feed to sustain the valley through late summer and fall. As a result the Donner Summit Valley dries up in late summer and early fall. The simple fact is that the two areas differ critically in their hydrology due to their difference in locations and amount of catchment area. Expecting the meadow restoration techniques that have worked for Perazzo Meadows to work for the Donner Summit Valley which has a small fraction of the water available at Perazzo is absurd. Even more absurd is the plan to decrease what little water storage there is through the summer by draining Van Norden Lake and wetlands. We’re talking about an entirely different geological & geographical reality here. Weber Lake (damned) feeds Perazzo Meadows throughout the summer as do other small streams and creeks. Summit Valley (Van Norden Meadow) is extremely limited to the spring runoff from the Sugar Bowl area, Signal Hill and that which makes its way south from Castle Peak. Once the snow pack has completely melted, it’s always been the waters of Lake Van Norden that keeps the meadow and the soils below surface hydrated and alive throughout the dryer months. Why is it that the executive director of the TDLT and Donald Trump seem to have so much in common with each other. It’s obvious that they both love the sound of their own voice. Or is it just their inflated egos and plain asinine stupidity?